In the spirit of ideas worth spreading, TED has created a program called TEDx. TEDx is a program of local, self-organized events that bring people together to share a TED-like experience. 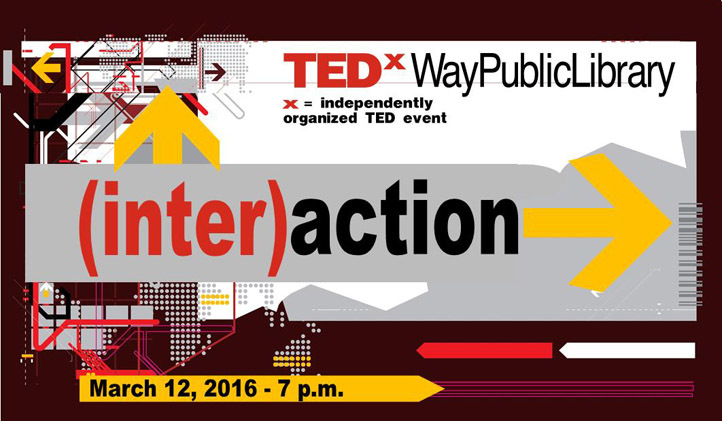 Our event is called TEDxWayPublicLibrary, where x = independently organized TED event. At our TEDxWayPublicLibrary event, TEDTalks video and live speakers will combine to spark deep discussion and connection in a small group. The TED Conference provides general guidance for the TEDx program, but individual TEDx events, including ours, are self-organized. Way Public Library is pleased to announce our second TEDx event! We believe that a library is an excellent forum for sharing ideas and gaining inspiration. Our mission in hosting a TEDx event is to get our community motivated. The theme for the event is “(Inter)action” and we want to tap our community – local and national – for speakers and attendees who have ideas and inspiration! The event will take place at the Way Public Library in Perrysburg, Ohio on March 12, 2016. Tickets go on sale February 1st and will be $25. We hope you will consider joining us and sharing your voice. Way Public Library’s second TEDx event will take place on Saturday, March 12th from 7:00-10:00 pm. What can you expect at the event? The core of any TEDx event is connection – at our event you’ll have the unique opportunity to interact with attendees and speakers. There will be the chance to hear dynamic talks by people passionate about what they do. In short, our hope is that TEDxWayPublicLibrary will inspire you – to create, innovate, and collaborate. You’ll also receive a TEDxWayPublicLibrary t-shirt and other goodies in our swag bag. During breaks there will be the chance to munch on complimentary savory and sweet treats. We are also working on a few surprises to keep you curious during the breaks (think demos and photos)! We hope that you will join us for this one-of-a-kind event!